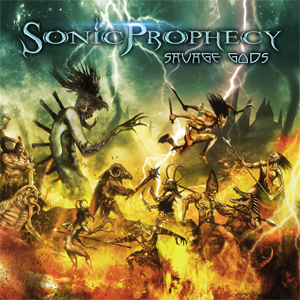 American power metallers SONIC PROPHECY are set to unleash their third full length Savage Gods via Rockshots Records on January 19, 2018. Featuring 10 fist pounding tracks rooted in traditional heavy metal melded with the symphonic beauty of power metal, SONIC PROPHECY capture the excitement and sound of such bands as IRON MAIDEN, JUDAS PRIEST, HELLOWEEN, HAMMERFALL and KAMELOT while blending other musical styles to arrive at a sound all their own. The band's new music video and first single "Night Terror" can be viewed on KNAC.COM right HERE. "We think our fans will love this album! Savage Gods, as a record, basically combines all of the things I think people liked about our previous releases and then moves us forward into new areas musically and lyrically. For our fans, there will be no mistaking this is SONIC PROPHECY, but we definitely cover some new exciting ground on this record." The upcoming release lyrically covers many topics, from quests and medieval wars, to mechanized genocide, to the dangers associated with extremist ideologies. Broadening and stretching their musical palate, Savage Gods will give fans an adventurous listening experience. It's an album that combines melodic hard rock, driving heavy metal, and chest pounding anthems in a way that is uniquely SONIC PROPHECY. Savage Gods is available for pre-order on Amazon along with single “Night Terror” available for download on iTunes and Amazon. Following Savage Gods' release, SONIC PROPHECY has plans to hit the road and tour across North America, Europe and beyond. The band has performed with TYR, ALESTORM, RATT, CINDERELLA, ACCEPT and SABATON.